Your Office 365 admin usually creates a team site for you, assigns a site owner, and then provides Edit permission to all your teammates. Three simple changes to your team site can go a long way: a meaningful title to promote discoverability, a logo to improve branding, and a good description to help others choose your site from search results. Note: If for some reason you don’t have a team site, contact your Office 365 Admin who can create one for you. To remove the default tiles, click Remove This. Note: If you don’t see the REMOVE THIS command, you do not have the appropriate permission. Enter a new title in the Title box and a new description in the Description box. Note: The description displays in search results and when you hover over the title. From your computer, click From Computer, click Browse, locate and select the image, and then click Open. 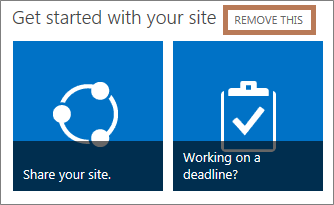 From a SharePoint library, click From SharePoint, locate and select the image, and then click Insert. Note: Microsoft does not provide sample logos. Change the title and description. Hover over the title to show the description as alt text. We have a new team site and I want to make it feel more like ours. First, I’ll change the title, description, and logo. Let’s remove these default tiles to reclaim some space. At the top of the page, I click Remove This. I want the title and description to reflect our team charter. So I click the Settings icon, then Site Settings. On the Site Settings page, under Look and Feel, I click Title, description, and logo. I fill out the Title and Description box. Adding our company logo improves the branding of the site and makes us look official. I’ll click From Computer, then Browse. I’ll locate and select the logo image, and then click Open. Now I’ll set a destination folder. I’ll choose the Site Assets library. I’ll click OK to save the changes.